Error Message: File format not supported BUT IT WASN'T ALWAYS LIKE THIS! Thread: Error Message: File format not supported BUT IT WASN'T ALWAYS LIKE THIS! Hello. I am having an extremely frustrating time with Premiere Pro CS4 at the moment and now that I have a deadline for a video to be edited it is really annoying. I've had Pro CS4 for a couple of years and in that time I have always been able to import a variety of video formats and lay them out on the timeline. This includes VOB files from homemade DVDs (not copywritten bought DVDs). 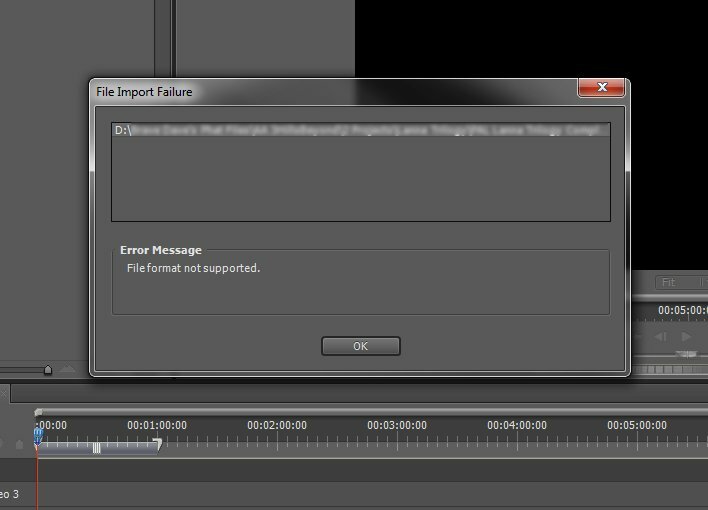 However, for some reason Pro has stopped allowing me to do this now, instead bringing up this error box. If this was always the case then it would be understandable but like I said, it USED to work and now it doesn't which is why it's so frustrating. It does the same for other formats too, like MPEG, which it is supposed to work for (according to Adobe). So what might have caused this and how do I fix it? I have reinstalled Premiere Pro as its codecs are built into the program but this didn't fix anything. I have installed Windows 7 Codec pack but nothing changed. Why oh why can my Premiere Pro not read common file types?? On a side note, can anyone recommend a good, free video converter for turning MPEG into WMV or AVI? Google is no good for video converters because there are so many dodgy ones out there which rank on the first page. Thank you in advance for any help and advice anyone can give me. I can recommend virtualdub and tpmgenc as converters. You might also want to try the stand alone adobe media converter included with cs4. Have you downloaded the latest updates for cs4? Hi Marc, thanks for that! I've had CS4 for over 2 years and had never realised that the media converter can be used as a stand-alone program (I've only ever used it as part of Premiere Pro). I'm not a complete novice, I swear!! I managed to convert the video succesfully although the sound was out of synch but that wasn't too hard to fix. I have also just downloaded all the CS4 updates. M2TS is not a supported file type.